Dress Like Your Wedding Cake – Is it Classy or Trashy? Every bride wants her wedding day to be perfect. You go to every length to make sure your day is special, that every last detail is taken care of. You want your wedding to be unique, like you. Your wedding dress is beautiful, you have spent hours carefully selecting the best flowers, and coordinating the bridesmaids dresses. And then there’s the cake, the focal point of the reception. You want your cake to look well put together rather than random. 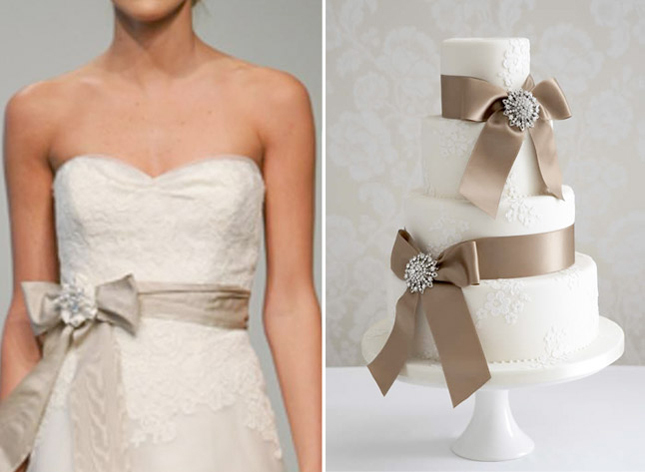 In matching your wedding dress to your cake, where do you draw the line between classy and trashy? While we definitely suggest using subtle elements of your dress in your cake, there is something downright tacky and overdone when you match them too closely. The cake should match the aesthetic of the wedding, not try to duplicate it in sugary form. We suggest instead that you chose one element of your design and put your focus there. Using the color of your wedding dress’ sash as fondant sugar flowers on your cake looks stunning, unique and elegant. On the other hand trying to incorporate the sash, the lace top, and the flowers, all into one cake can end up looking like a Moulin Rouge disaster. If your dress has pearls on it you may want to try a thin pearl border around each of the cake layers, or you may want to use the color of your bridesmaid’s dresses as a tasteful icing ribbon on your cake. If your dress has feathers, go ahead and add some feathers to your cake. If your dress is sparkly and gemmed, bedazzle your cake in a few key areas. Big blooms work just as well as an accent on your cake as they do accenting your dress. Ruffles, which have been wildly popular on dresses recently, can also be incorporated onto your cake by swathing graceful fondant ruffles along the side. You can even recreate that beautiful lace trim on your dress if that’s what you desire. Wedding Retailers such as David’s Bridal has all sorts of styles that would incorporate perfectly with cake designs. Whatever you do, remember to have fun and be creative. Subtly is your friend when it comes to your cake. Using elements of your dress on your cake is far more elegant and powerful than glomming up the whole cake with matching décor. 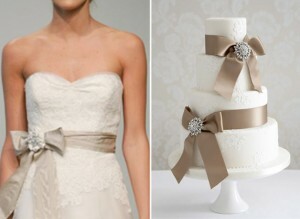 Another recent trend which you may want to consider is cakes made in solid colors that compliment your bridal colors. If you are feeling gutsy this may be the cake for you! Martha Stewart Weddings has tons of great cakes of this sort to choose from. Especially with this option, however, remember to be subtle. If you are going with a non-traditional colored cake, bedazzling the cake or adding tons of decorations may be a bit over the top. While this may appeal to every five year old girl’s fantasy, chances are it is not the look you are going for. At the end of the day it is your wedding, create the look you want, do what your heart desires and have fun! Just don’t go overboard.